St. Francisville has been the center of culture, government and religion since it was settled in the opening years of the 19th century, but the little port city of Bayou Sara along the Mississippi River just below the bluffs was the center of commerce, while the surrounding plantation country provided the economic driver for both communities. Today, Bayou Sara is no more and St. Francisville has become the center of commerce as well as culture, but there remain a number of recently rejuvenated historic plantations that attract visitors seeking an understanding of what life was like in the Cotton Kingdom. One of the most significant and earliest of Louisiana’s state historic sites, Oakley Plantation and its surrounding hundred wooded acres reopened with an old-time Christmas celebration the first weekend in December after being closed for nearly a year for lead abatement. During that time the house underwent a complete exterior restoration and was repainted in the original colors, white with darker green trim, plus interior paint touch-ups and furniture conservation. Popular as the central focus of the Audubon State Historic Site for more than half a century, Oakley is a splendid West Indies-style three-story structure with jalousied galleries and has a fascinating visitor center/museum, picnic facilities and hiking trails, detached plantation kitchen reconstructed on original foundations with weaving and wash rooms, a barn full of horse-drawn vehicles and farm implements, and several rustic slave cabins. These dependencies are periodically utilized to augment the house tour with demonstrations of early practical skills and fascinating living-history events; weekends in January the highlights will be “Time Travelers” featuring the thunder of cannon in 1810 (January 6); “The Boys of ’61” replicating conditions on the eve of war as civilians become soldiers (January 20); and “Open-Hearth Candle Making” (January 21). Oakley Plantation was responsible for artist John James Audubon’s fruitful stay in 1821, when he was hired to tutor Eliza, the young daughter of the Pirrie family, and painted dozens of his Birds of America studies in the area. His pupil would enter into marriages that tied Oakley to other early plantation families. Her first marriage was to a dashing young Barrow cousin who contracted pneumonia on their honeymoon and died before the birth of their first child; her last was to an attorney called by her friends “a trifling sponge,” lured away by the Gold Rush and absent when she died of childbed fever. It was her second marriage, to the eminently respectable first rector of Grace Episcopal Church, that produced the descendants who were still struggling to keep Oakley going into the 20th century; it also united the plantation with another state historic site, Rosedown, when Eliza’s son James Pirrie Bowman married the daughter of Rosedown’s Barrow/Turnbull family. A glorious double-galleried Greek Revival structure embraced by the surrounding 28 acres of formal gardens, the house at Rosedown was constructed in the 1830s and remained for more than a century in the original family. Now owned by the state, it is not only a State Historic Site but also a National Historic Landmark in recognition of its enormous significance. A number of original outbuildings remain, and as at Oakley they are often used to illustrate various facets of early plantation life, as are the grand gardens. Another important Greek Revival structure is Greenwood Plantation, which has recently found new owners and a new lease on life, having enjoyed more than its fair share of miraculous resurrections. Its story began in 1798, when widowed Olivia Ruffin Barrow arrived with 50 wagons full of possessions, 150 slaves, six children (some grown), and the wealth with which to build a new life in a new land. One of her grandsons became the first and short-lived husband of Audubon’s pupil Eliza Pirrie. Another grandson, William Ruffin Barrow, in 1830 built his home on family property that would eventually grow to 12,000 acres. Nearly 100 feet square, the Greenwood house was completely surrounded by 28 Doric columns of brick, rising more than 30 feet from a porch set 5 feet above ground level, supporting an intricately detailed entablature and solid copper roof topped by a belvedere from which Barrow could survey his cotton and sugar cane fields being tilled by some 750 slaves. The Civil War brought tragedy, but in the early 1900s the plantation was purchased by Frank and Naomi Fisher Percy, who restored the house and enjoyed sharing it with the public. Surrounded by live oaks, Greenwood was called the finest example of Greek Revival architecture in the South, featured in magazines, visited by thousands of tourists, and beloved by Hollywood as a movie setting. And then on the night of August 1, 1960, tragedy struck again; lightning started a fire that destroyed everything but columns and chimneys. Eventually the house was rebuilt as close to the original as possible, and now new owners have brought new enthusiasm, sharing the home with visitors for tours and special events as well as overnight stays. 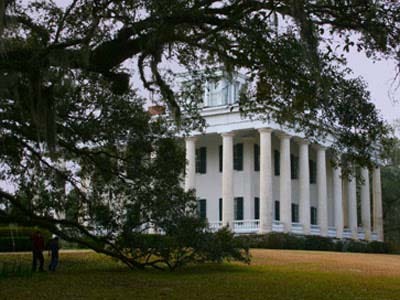 Yet another plantation house that has found new energy and enthusiasm with a new generation is The Myrtles, which has its own connections with Oakley Plantation and Audubon’s pupil Eliza. 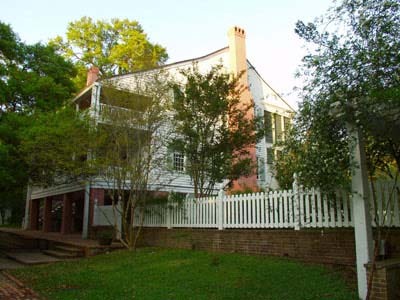 Eliza’s mother Lucretia Alston Pirrie’s first husband was Ruffin Gray; her sister Ann Alston was the wife of early settler Alexander Stirling, and their son, born in 1795 and named Ruffin Gray Stirling for his uncle, purchased The Myrtles in 1834. The plantation, originally known as Laurel Grove, was established in the late 1790s by General David Bradford, who represented Monongahela Valley farmers opposing an excise tax levied on their corn whiskey by US authorities. As one of the ringleaders of the so-called Whiskey Rebellion, Bradford narrowly escaped with his life to Spanish territory and built the north section of the house on a land grant of 650 arpents. After yellow fever epidemics in 1823 and 1824 killed the wife and two young children of the next occupant of The Myrtles, the property was sold, along with improvements and slaves, for $46,853.17 to Ruffin Gray Stirling. After a succession of owners, it was purchased in 1992 by the Moss family, and now a new generation, son Morgan, is implementing a long-needed restoration and re-landscaping with big plans for the future of this popular tourist destination. Other plantations, the early Cottage Plantation which remarkably resisted gentrification through the generations of the same family, and Catalpa Plantation which has family ties to Rosedown and Oakley, are open only on weekends (The Cottage) or by appointment (Catalpa). Greenwood, Myrtles, and Rosedown are open to the public daily except holidays, while Oakley is open Wednesday through Sunday. Together they present a good picture of early life in the Felicianas, when pioneering families were joined together by blood, marriage, economic necessities and history, and they continue to hold much interest for the steady stream of tourists enjoying the St. Francisville area. Located on US Highway 61 on the Mississippi River between Baton Rouge, LA, and Natchez, MS, the St. Francisville area is a year-round tourist destination. A number of splendidly restored plantation homes are open for tours: The Cottage Plantation (weekends), Myrtles Plantation, Greenwood Plantation, plus Catalpa Plantation by reservation; Afton Villa Gardens and Imahara’s Botanical Garden are open in season and are both spectacular. 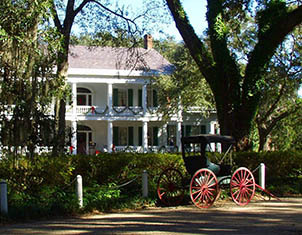 Particularly important to tourism in the area are its two significant state historic sites, Rosedown Plantation and Oakley Plantation in the Audubon state site, which offer periodic living-history demonstrations to allow visitors to experience 19th-century plantation life and customs . The nearby Tunica Hills region offers unmatched recreational activities in its unspoiled wilderness areas—hiking, biking and especially bicycle racing due to the challenging terrain, birding, photography, hunting, and kayaking on Bayou Sara. There are unique art galleries plus specialty and antiques shops, many in restored historic structures, and some nice restaurants throughout the St. Francisville area serving everything from ethnic cuisine to seafood and classic Louisiana favorites. 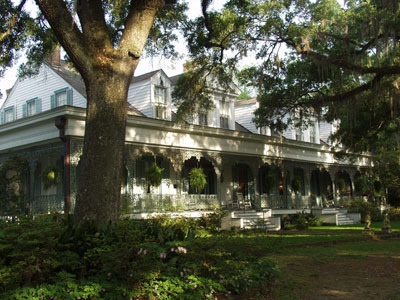 For overnight stays, the area offers some of the state’s most popular Bed & Breakfasts, including historic plantations, lakeside clubhouses and beautiful townhouses right in the middle of St. Francisville’s extensive National Register-listed historic district, and there are also modern motel accommodations for large bus groups. For visitor information, call West Feliciana Tourist Commission and West Feliciana Historical Society at 225-6330 or 225-635-4224, or St. Francisville Main Street at 225-635-3873; online visit www.westfeliciana.us, www.stfrancisvillefestivals.com, www.stfrancisville.net or www.stfrancisville.us (the events calendar gives dates and information on special activities).